I have to admit I was excited and then intimidated to share the stage with women that I admire. Anna Scheller came over from Texas to give us some awesome tips on sales, Lilach Bullock, one of Forbes Top 20 Women Social Media Power Influencers flew in from London. The programme was full and included published authors, TV personalities and amazing entrepreneurs. I hope to be featuring some of the speakers in my fabulous woman series shortly. 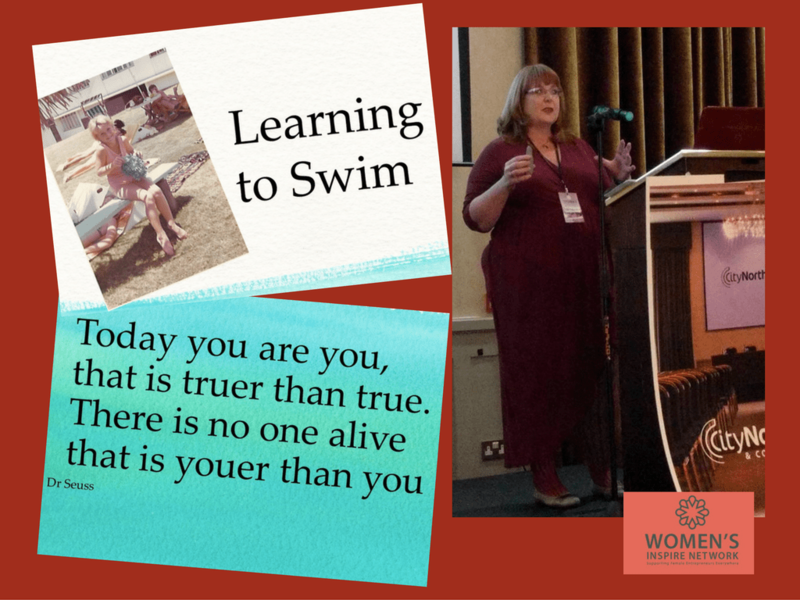 I spoke about being the best you that you can be, telling my story of how I have got to where I am today, through the metaphor of learning how to swim. I actually swam like a fish as a child – you couldn’t get me out of the water, but in truth my inner self-confidence never quite matched the smiley face that I portrayed. My story is no different to many women. I decided to share my story because I am lucky and blessed. I have come through it and I have kicked off the bottom of the pool. Now I am swimming and I want to tell people that no matter what happens – drowning isn’t an option. A lot of things have happened to me – both physical and mental health have been stumbling points but I have picked myself up and started to swim again. During my talk I became emotional. I was caught in the moment talking about some tough moments This is when you realise what this network is about. Samantha Kelly, organiser of the event, co-founder of the network and all round fabulous women, jumped on the stage and gave me a hug! Just what I needed to continue on. There is a very special quote by my favourite childhood author and this was a central part of my message. This quote really epitomizes my new life. I am determined to be fabulous despite the curveballs that life throws at us. I am so enjoying my new career as a personal branding coach. Knowing that you are the best you can be is the first step. The next step is marketing yourself and finding your tribe. It was wonderful to share this joy with 250 fabulous women and a couple of men on the day. People are the most important thing in my life. And as Dr Seuss say, we are all individual. On this very special day, and the night before I received and received and gave a lot of hugs. Each one of the people I met, and hugged, was unique and beautiful. Each of us has a story and we all inspire each other – isn’t that so special? I just love it that people walked up to me and said ‘Kerry’ because they knew me from social media and immediately gave me a hug. The warmth of this community is amazing. Everyone is welcomed and nobody need feel left out. Following my presentation I got lots of hugs too and this is really important. As a communicator (blogger, speaker, writer) feedback is what matters. Communication is only broadcasting if it doesn’t go two ways. 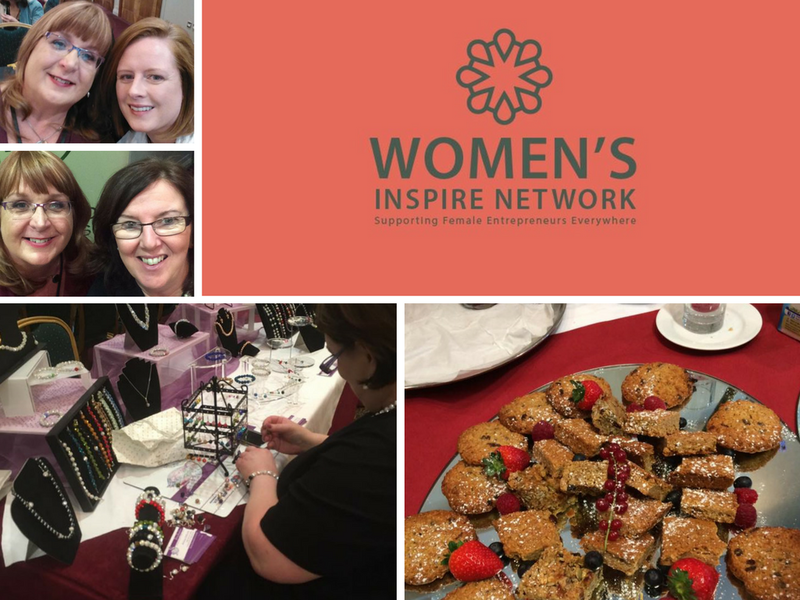 The Women’s Inspire Network now has a wonderful website which you can view here. I would encourage you to sign up and receive the updates. 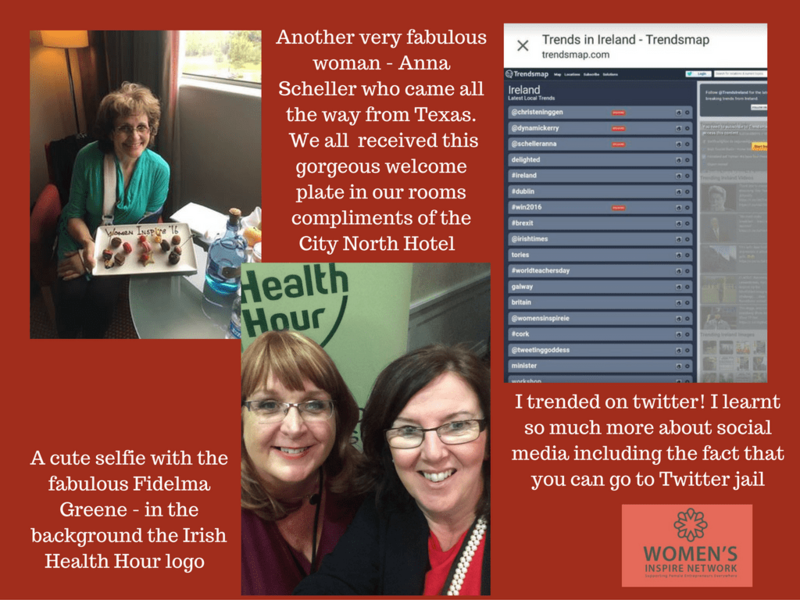 Finally I just want to thank the wonderful Dolores Andrew Gavin from Irish Health Hour for getting me to the event (with a lot of laughs along the way). I am quite sure that there is going to be more than one post from me about this event. My head is still buzzing from the inspiring day. p.s. I was a disaster on the day and forgot to take pictures. Thank you to everyone for helping me out!